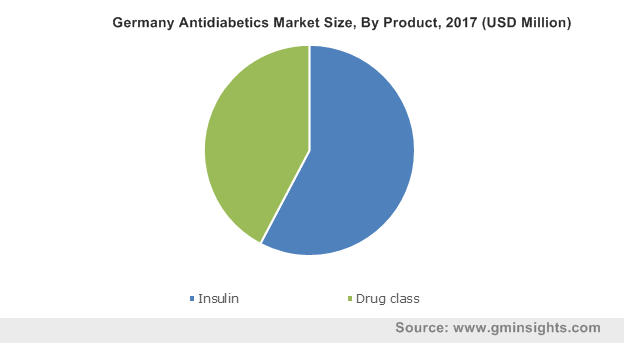 Antidiabetics Market size was valued at USD 54.6 billion in 2017 and is expected to witness growth of over 10.6% CAGR from 2018 to 2024. Growing pervasiveness of diabetes worldwide will spur global antidiabetics market growth over the forecast timeframe. According to World Health Organization, in 2014, 422 million people suffered from diabetes mellitus, estimated to become the seventh death-leading cause by 2030. Thus, rising prevalence of the disease will lead to high adoption of antidiabetic drugs to control blood sugar as well as control disease complications. Moreover, accelerating number of obese/overweight people, pursuing unhealthy lifestyle habits is significantly increasing the risk of suffering from diabetes. Growing incidence of diabetes can be attributed to increasing obese population, thereby augmenting demand for antidiabetics in coming years. Insulin product segment is forecasted to progress at 12.3% CAGR over the projected period. With expanding patient population majorly suffering from type 2 diabetes, the need to administer insulin therapy will grow in the forthcoming years. Insulin is also used in combination with several oral drugs for better control of blood glucose. In addition, insulin also needs to be externally injected to patients with type 1 diabetes, that should impel segmental growth in coming period. Among several types of insulin, rapid acting analog insulin will show fastest growth over the forecast period. Drug class product segment held 45.7% market share in 2017. DPP-IV drug class accounted for the largest revenue size in 2017 and will witness similar trend over the coming years. DPP-IV when combined with other antidiabetic agents are known to show positive effect on glucose control. These drugs show neutral effect on weight that further favours segmental growth. Development of new antidiabetic drugs including DPP-IV will boost segment growth in upcoming years. Adult patient population segment accounted for largest market share of 51.0% in 2017. With increasing risk factors such as age, obesity, lack of physical activity and rising consumption of carbohydrate-rich food among adult age groups has considerable effect on development of diabetes. According to a recent study, majority of adults in comparison to other age groups are suffering from type 2 diabetes. According to the International Diabetes Federation (IDF), in 2017, 1 in 11 adults were suffering from diabetes across the globe. Similarly, consumption of antidiabetic drugs has increased considerably in Europe during recent years. Such factors will impel adults segmental share in forthcoming period. 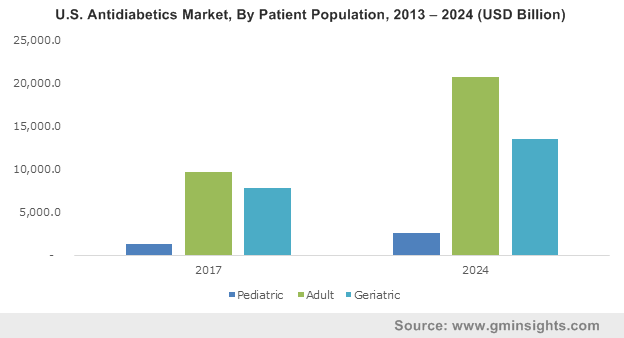 Pediatric patient population segment will grow at 11.4% CAGR over the projected period. Number of diabetes cases among paediatric population are growing rapidly. Along with type 1 diabetes, that is majorly found in children, paediatric population suffering from type 2 diabetes is also significantly escalating. Additionally, implementation of several children programs for diabetes will support antidiabetics market growth over the foreseeable future. Oral antidiabetics market contributed to largest revenue size of USD 39,714.7 million in 2017. Oral hypoglycaemics are widely used for T2DM patients. Newer drugs are largely being created by firms to be given through oral route for more efficacy as well as to overcome limitations of non-oral medications. Patients with T2DM are required to adopt oral medication within a couple of years post-diagnosis. Also, oral antidiabetics improve beta cell function indirectly while reducing glucotoxicity. Above benefits will assist oral antidiabetics segment growth during the forecast period. Insulin pumps market will record highest CAGR of 11.3% during the projection timeframe. Insulin pump usage is recommended in patients having high resistance to insulin and weak glycaemic control. Insulin pumps prevent administration of multiple injections along with delivering high efficacy should escalate the customer preference. Availability of reimbursement in some countries will further accelerate demand for insulin pumps in the coming years. 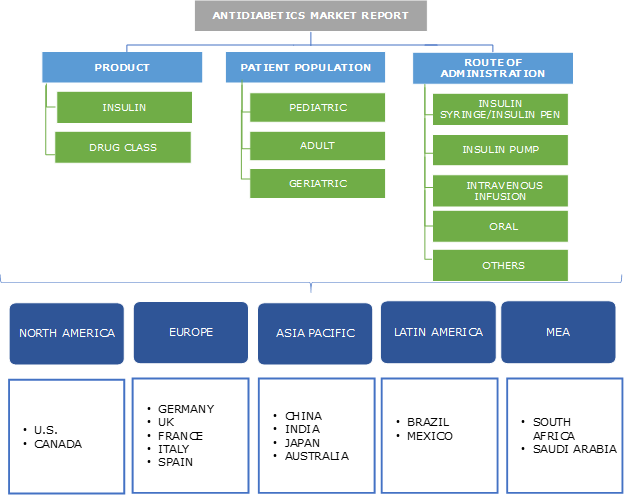 Few of the prominent industry players operating in global antidiabetics market include Novo Nordisk, Sanofi, Eli Lilly, Merck and Boehringer Ingelheim. Key players are implementing product innovations along with collaborations to reap greater profits in the market. For instance, in October 2018, Eli Lilly partnered with Lupin to distribute Eli Lilly’s diabetes injections. The strategy is aimed at expanding company’s medications across India. Antidiabetics industry witnessed the first commercially available medication in 1936 known as PZI (protamine zinc insulin). Nordisk followed the first drug development when NPH (neutral protamine Hagedorn) was released in Denmark by the company. Further innovations were made subsequently including lente series of insulin that was trailed by first approved rapid-acting human insulin in 1996. Recently, firms are focusing on breakthroughs in antidiabetics market that will further progress the innovations in antidiabetic drugs. 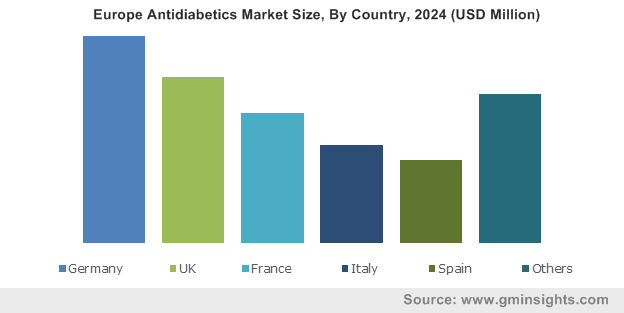 In addition, expanding patient population across the world will largely contribute to rise in demand for antidiabetics, thereby augmenting antidiabetics industry growth in the foreseeable future.